Stationary biking is an effective and challenging cardio workout. Stationary bike exercise classes were introduced into the fitness world in the mid-1990s. These studio cycling classes continue to be popular because they provide the challenge of outdoor cycling in comfortable, climate-controlled studios. If you're bored with your current routine, consider adding one or two stationary bike workouts to your weekly fitness regimen. They're an effective way to incorporate cardiovascular exercise and keep your workout interesting. The benefits of stationary biking exercises go beyond the convenience of having a climate-controlled environment. 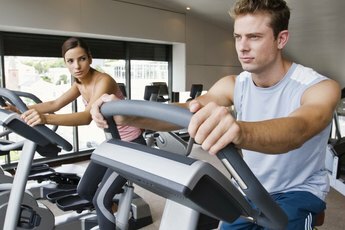 In "Morning Cardio Workouts," June E. Kahn and Lawrence J. M. Biscontini state that in addition to improving flexibility in your legs and strengthening your quads and hamstrings, stationary biking also engages your calf muscles, your anterior tibialis (the muscle that runs along your shin) and your ankle. Your abs and back are also called upon to assist when cycling as you hold yourself upright and aligned. Also, stationary bike workouts don't have to last for an hour or more for you to reap the benefits. 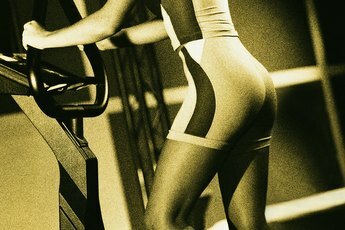 In their book "Fitness for Dummies," Suzanne Schlosberg and Liz Neporent tout interval training on a stationary bike as an effective way to burn more fat in a shorter amount of time. The Mayo Clinic reports that a 30-minute interval workout that alternates short bursts of intense exercise with low-intensity recovery periods offers the same health benefits as working out at a steady pace for twice as long. 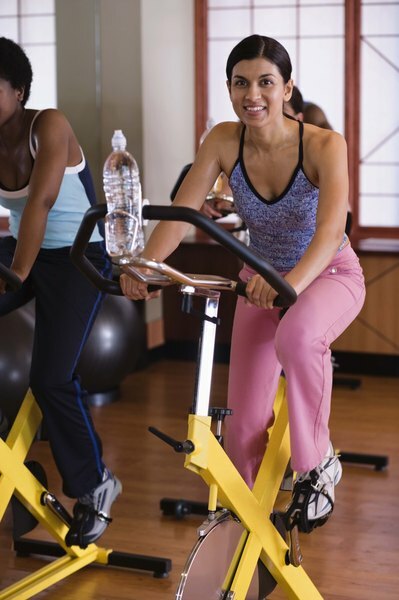 If your health club doesn't offer an indoor cycling class, you can do your own stationary bike workout at home. In their book, "Lifetime Physical Fitness and Wellness," Werner W. K. Hoeger and Sharon A. Hoeger recommend shopping around when choosing a stationary bike. A lower price doesn't always mean lower quality, but make sure the seat is comfortable, the frame is stable so that the bike doesn't shake and the pedaling motion is smooth and consistent and doesn't stick. You should be able to adjust the seat so you're at the proper height for an effective exercise. The seat height is appropriate if your knee is only slightly bent when the pedal is at its lowest position. You can develop your own stationary biking program, based on the five movements typically used in studio classes. Put together an effective, challenging and quick workout by alternating among the following: a basic seated position, a seated position with resistance, standing while pedaling, standing while pedaling with resistance, and quickly rising from the seat in a forward motion, as you would if you were racing to pull ahead of an opponent. For example, you could start in the basic seated position, cycling at a comfortable pace, for a five-minute warm-up. Then, remaining seated, increase to your maximum speed and pedal for another three minutes. Increase the resistance and reduce your speed for two minutes before increasing your speed -- leaving the resistance unchanged -- and pedaling for three minutes. Reduce your speed and stand while pedaling for two minutes. Sit back down and increase your speed again, pedaling as fast as you can for two minutes, then reduce your speed and rise from your seat, surging forward as you pedal for one minute. Reduce the resistance and your speed as you sit back in the seat, and pedal for a five-minute cool-down. Getting enough rest between workouts is important to your health and fitness. In his book "101 Cycling Workouts," David Ertl notes the importance of a recovery day to allow your body and mind to rest to maximize the benefits of your workouts. You can either schedule a preferred day off from training or base that off day on your work or travel schedule. However you decide to schedule a rest day, don't feel guilty about not working out. Get a full night's sleep, eat healthy meals and perhaps indulge in a leg or full-body massage. If you can't resist doing something physical, Ertl advises that you keep the activity moderate, such as going for a walk.